Build it is now launched and the Pre-order Promo is now finished. With over 7,000 pre-orders placed, THANK YOU to everyone who helped make the Build it launch a bestselling success. We've never needed employee engagement more. The time is right for change. The response we've had to Build it is incredible and the fantastic early reviews we've had tell us that the book can genuinely help. Pre-orders are critical to building momentum for a book. They tell the booksellers that the book should be stocked and positioning on bestseller and "top books" lists means that more and more readers see them. Thank you so much to everyone who pre-ordered Build it. You got the book to be the Number 1 Bestseller on Amazon in the Human Resources category in both the UK and Australia. Briefly, it was even the Bestselling Maths book in the UK due to a mishap in classification! An exclusive "The hidden chapters" ebook containing 20 pages of work which didn't make it to the final cut. An exclusive, invite-only webinar on Monday 19th March where Debra and Glenn talk about the process of writing the book and run a live Q&A for readers. A free Engagement Bridge™ mousemat and sticker sheet so the bridge is always at hand on your desk. An exclusive, limited edition, A5 Rebel Playbook notepad for recording your actions and to-do lists in. A £10 voucher to spend at the Rebel Playbook Merchandise Shop on books, apparel - anything you like! Everyone who sent their invoice or receipt to us, we'll be emailing you details on how to claim your gifts in the next few days. We are so incredibly grateful for your early support. It has been truly inspiring meeting and talking to so many amazing amazing people as we've put this project together. We are incredibly excited at the response and support from all of you. 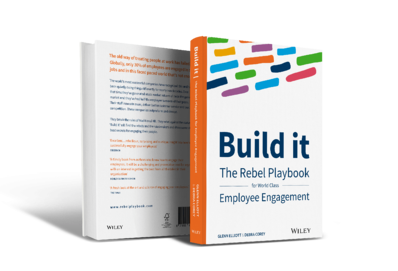 As rebels together, we really can make the world a better place to work.